I started chasing my dreams in 2008. After two years of hard work to save up enough money, I finally booked my ticket to South Africa for a special two week course on shark behaviour. It really was a dream come true – although looking back a quite overpriced one. Anyways, I managed to see great white sharks almost every day in these two weeks, and learned a lot about the body language of these amazing predators. One of the things I will always remember are the deep blue eyes – yes, blue not black – of the sharks. But two weeks passed too quickly and now I wanted to see sharks again, and again and again. I travelled to Egypt after, searching for hammerheads in the Strait of Tiran, and luckily found them – well two of them at around 35m depth. It was breath taking. And they really didn’t care about us at all, just another couple of weird-looking, loud-breathing, bubble-making humans that decided to hang out in the blue. But I was so happy and knew life would never be the same. I started to follow my dream – working with sharks. Surprisingly I only had to wait 3 years for such an opportunity. 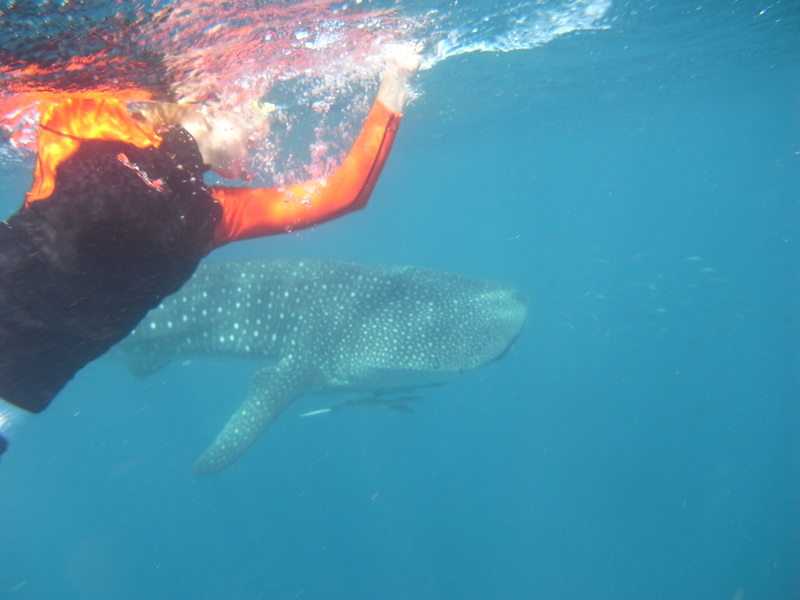 I found a job offer in Ningaloo Reef, Western Australia, as a “whale shark spotter”. That sounded like the dream job to me, only till I realized that the dream was only underwater and the tough reality waited above the surface. Nevertheless, I applied for a visa, got it, booked a flight and off to Perth I went. Long trip though; when I arrived at the local airport in Exmouth, there was no one to pick me up. That wasn’t a good sign. Unfortunately, I would be proven right about the bad feeling I had from this point on. I made it to company’s office, where I had applied beforehand, however, the former recruiter wasn’t working there anymore and they didn’t really know what to do with me now. So I waited several hours till my new boss found the time to talk to me and offered to give me the job I had applied for. With the former recruiter my temporary accommodation was gone as well, the alternative – the kitchen room next to the equipment shack on my boss’s property. What an awesome welcome and great start in a new country. But things got better over time and most importantly, I have seen my first whale shark (and many more after). I do remember clearly the moment before I jumped in. The deck hand shouted “whale shark, get ready”, and my colleague was the first to jump in to make sure it is a whale shark (not tiger or white or whatever, which sometimes can happen). I was nervous, excited, totally overwhelmed, but still needed to leave enough space and room for the guests (as they paid a lot of money to see it and I only assisted the crew on my very first day on the boat). But my moment came and I jumped in, paddling towards the big dark shade of what was supposed to be a point on my bucket list come true. And it was breathtaking; they are big, massive, elegant, gentle, damn beautiful, and I never wanted to get out of the water ever again. But realistically I had to and did so. The daily work wasn’t just swimming with the spotted giants; it started out by preparing the boats, cleaning, fuelling up and welcoming the guests. Then a quick trial swim for everyone to make sure people can actually keep their heads above the water. Of course the time with the whale sharks was the highlight of each day, but we also offered an afternoon dive for people who wanted to see the beautiful reef. As soon as the guests had left, we cleaned again. Then back to the shack and cleaning dive equipment. Long days with hard work, but the next few months working with these animals was an adventure every day. Each day we seen them was a day definitely worth living for. But the problems with my company remained and after not getting paid for four weeks, broken boats, half the working hours promised (and you only get paid when you work) and working in a restaurant as dish washer for 8 hours after the 12 hour days on the boat, just to make enough money to live, I decided to leave. I learned my lesson. But not without new friends, great memories and the desire to see these animals again. And so I did, but that’s another story.